hack, cough, ah-choo! It’s a symphony of sick around here. A wicked week full ofrunny noses, too much television, gallons of apple juice, a tent set up in the living room so we can all lay on the sleeping bag and read because we have no energy for anything else, and knitting, yes lots of knitting too. Sunrise Circle Jacket is done and it is GORGEOUS! If my camera werent in the room where the baby is sleeping I would take advantage of the sunshine this afternoon and take pictures for you, but there is no way I am risking waking her up… you’ll have to wait. I also finished the cotton baby blanket and am halfway into a sock for my grandfather’s birthday next month. Now if you’ll excuse me I need another glass of apple juice. It’s been a heck of a week around this hutch. Little bunny, who cut two teeth a couple of weeks ago has made the transition from nursing to bottle. Me, I’m delighted but the big surge of hormones that accompanies the transition has made me weepy… I can’t believe how fast my baby is growing up!!!! And Big sister bunny has been a dream, is it possible she’s over the terrible twos? Pinch me. I dayream sometimes about what it will be like when the bunnies are both old enough to not require 99.9% of my attention. Man will I be able to knit a lot then! Actually I’m able to accomplish quite a bit of knitting during naptimes, periods when my husband is watching the girls, and when I can sneak it in while waiting for the bank teller, watching at the playground, or after bedtime. But I have to be honest I’ve had to really adapt my knitting style in order to be able to knit during this period of my kids’ lives and I do look forward to their gaining some independence and getting back to my old approach. I know I am in the knitting minority but I like to work one project at a time. And (gasp) I dont like having much of a stash. I’m more of a see the pattern, fall in love, buy the yarn,knit the project kind of gal. But I learned pretty quick that it’s easier to knit with kids if you have a few different projects on the needles to suit your knitting needs. I like to keep something mindless in the car… usually a simple pair of socks, but right now it’s the circular baby blanket (which is probably a bit too big but whatever… I need to finish it and it’s mindless), that way I can work a few stitches when I’m at the drive up teller, and I’ve got it if free time at the park makes itself available. I keep something of medium difficulty on my kitchen counter, next to my laptop… right nowit’s a secret scare-isle hat I’ve designed (sorry I can’t talk much about it). I can supervise the girls from this spot and can often sneak in a few rows here and there. I save pattern reading and lace for times when the bunnies are asleep or out of my care. Right now that means the Sunrise Circle (which is almost done, woo hoo). Sometimes, when hauling a project around gets tiresome or I’ve caught the start-it bug, I’ll even work one of those upstairs lying in bed and and one downstairs, where our TV is located. It works but sometimes I really wish I could just sit down on a rainy Saturday afternoon with a cup of coffee and hours to devote to a project. And if I’m patient (and a little lucky)in a few years I’ll be able have an afternoon like that, sitting on the couch knitting , with two little bunnies by my side. Has been mailed off as a birthday gift for a friend. It’s the second time I’ve made this pattern (I used the same big ball of Lion Kitchen cotton in neutral to make them both), and I would make it again. I can’t say that about many patterns, but this one is very satisfying. 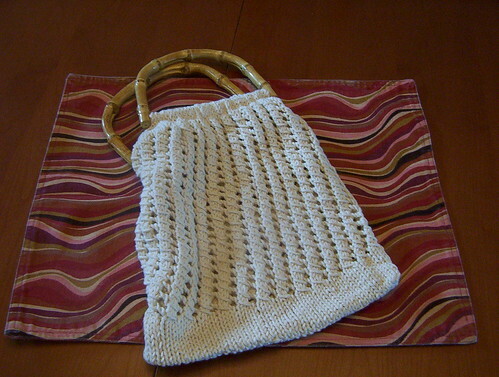 The knitting isn’t boring and the end product is a really sturdy, polished looking fabric. The first one I made as a gift for one of my cousins, I used a pair of round bamboo handles the same color as these. I found them in my craft basket and really just wanted to get rid of them. But then I loved the way they looked with the bag… it rubbed the 70’s funk off of them and just made them seem cool. So I sought out similar handles for this bag. I’m not a big fan of 1970’s decor, but my house was built in 1970 and I’m trying to work with it. I found these placemats at the Crate and Barrel Outlet for $1 sometime ago. I love them too. I don’t have any love though (and refuse to hunt down a picture) for the set of bamboo handled cutlery my parents had in the ’70’s. An eraser the size of Texas couldn’t rub the funk off of those things. I’m certain it was the exact size and shade of bamboo as these handles (I think my Dad bought them as a gift for my mom in Thailand when he was on his way home from Vietnam … either that or she got them on sale at Gemco). Ahhh onemore thing off the list, next post I’ll share my revisions with you. And maybe some pictures (if I’m lucky I’ll get natural light next time). You are currently browsing the Bunny Slippers blog archives for February, 2007.